We hear a lot these days about developing core muscles, but what are they and why do we need to train them? Although a portion of the core muscles are visible surface muscle, most of the muscles that make up the core are deep tissue muscles such as the transverse abdominus & multifidus. Recent research has shown that these deep core muscles switch on in anticipation of movement and act as a corset, stabilising the back and pelvis as we load and unload our joints. The timing and activation of these core muscles is critical for effective load transfer – as is the co-contraction or way these muscles work together with each other. Research has also shown that during episodes of back or pelvic pain, the timing or co-contraction of these deep core muscles can be inhibited, placing an increased load on the more superficial back muscles. Once the core muscles are inhibited they don’t automatically switch back on once the back or pelvic pain goes. 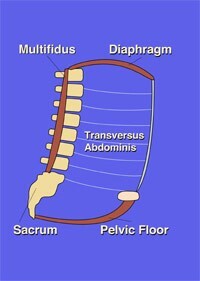 They need to be ‘trained’ to regain the correct timing and co-contraction to stabilise the back and pelvis once again. Core muscle training exercises like Pilates helps restore both timing and co-contraction by teaching the brain to recruit groups of muscles at a what we call sub-maximal co-contraction. It is important to restore this prior to core strengthening exercises. Why? Core strengthening without restoring the correct timing and sequencing of the core musculature will only increase the load on the more superficial muscles. To improve core strength, you must train the core muscles first! And, this is where Strive Physiotherapy & Pilates can help you.